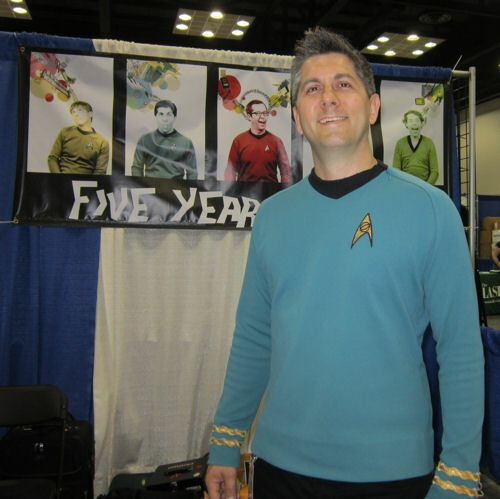 Indy Pop Con 2015 Photos, Part 3 of 3: What We Did and Who We Met « Midlife Crisis Crossover! 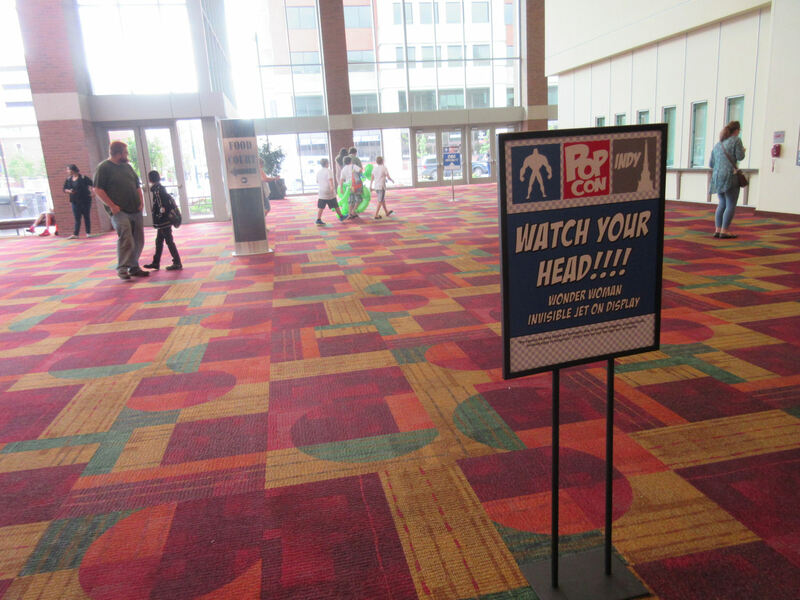 This weekend the second annual Indy PopCon once again overtook our Indiana Convention Center with a festive mix of comics, gaming, voice actors, established actors, animation, podcasting, and various other manifestations of pop and geek culture in general. This year’s guest list also encroached upon a new entertainment frontier: the rapidly expanding world of YouTube stars. My wife and I had never heard of any of those who were invited, but we were outnumbered several thousand to one in that regard. We attended Saturday only for a limited time for a number of reasons with a short itinerary and modest expectations, but we took photos as usual for You, the Viewers at Home. Part One was some costumes. Part Two was some more costumes. 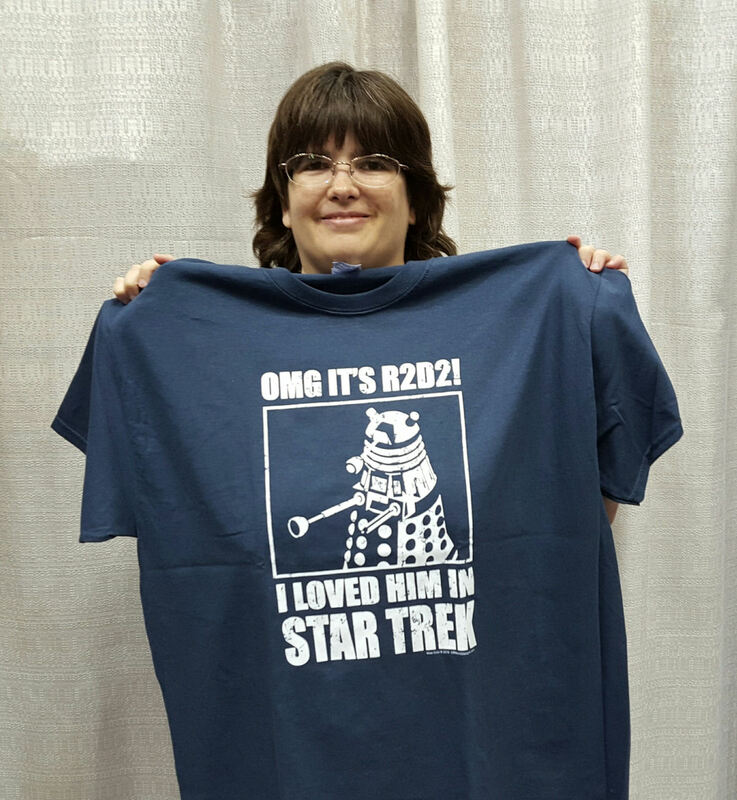 Part Three is some not-costumes, unless my wife’s new favorite T-shirt counts. Anne and I had attended the inaugural Indy Pop Con and took so many pics that I ended up milking it for eight straight entries, which you can view through MCC’s “Indy Pop Con” tag if you weren’t following us at the time. Sadly, the con’s 2014 attendance was below hopes and expectations, but those of us who showed up had a ball and were ready for an immediate encore. 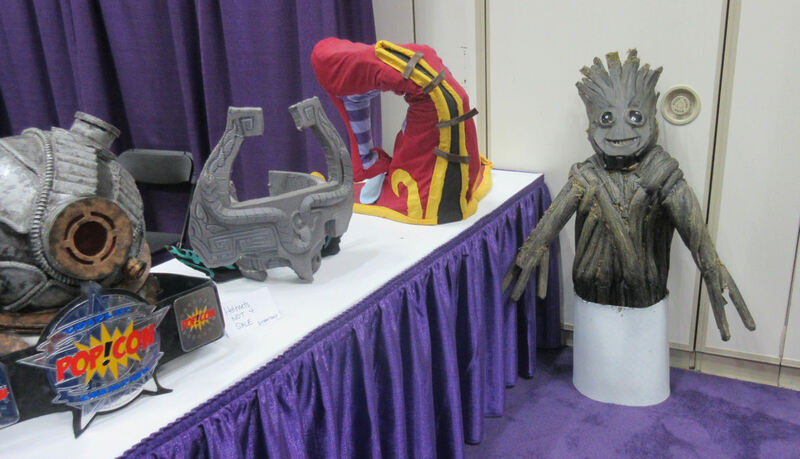 Quite honestly, Indy Pop Con was our favorite Indianapolis convention experience of 2014. Funny thing about this year’s: we almost didn’t go. For their sophomore follow-up the showrunners experimented with the guest list and invited several hosts and personalities from the previously unrepresented kingdom of YouTube. At first glance I recognized none of them. I subscribe to a handful of YouTube channels, but none of their hosts were on the list. My wife subscribes to zero channels and was no help. For youth-culture verification purposes I sent the list to my son, a proud cord-cutter who recognized only one name: Markiplier, one of the “Let’s Play” guys with a huge fan following. Maybe someday I’ll look him up and check out the fuss. Indy Pop Con kindasorta tried to reel us in. Several Hollywood actors were on the roster, past and present, most of whom were from movies and shows we’d never seen or didn’t want to remember. (Sorry, younger readers, but Power Rangers were after my time.) There was one voice actor who’s done several noteworthy PS3 games I’m looking forward to playing someday but haven’t gotten to yet. A few established comic-book creators were in the house, albeit fewer than last year. We thought it was cool that Star Trek: the Next Generation‘s John DeLancie would be in the house, but my wife has met him multiple times. There were podcasters, game creators, makeup artists, pro cosplayers, and so on, and so on. At the eleventh hour they added Survivor‘s Rupert Boneham, a super-friendly guy who has his own kids’ charity, whom we already met at the 2012 Indiana State Fair during his spirited but doomed gubernatorial campaign. I first raised an eyebrow when they added the Edward James Olmos to the list. Anne had no Excitebike in this race and was willing to respect whatever decision I made. I took several more weeks to think about it. Some thoughts take longer than others to percolate. Three days before the con, I remembered Olmos was in Blade Runner. I bought our Saturday-only tickets online that evening. Without any high-pressure stakes requiring us to show up at our normal time of 2-3 hours before showtime, we strolled in around 9 a.m., picked up our mandatory wristbands at Pre-Registration, and marveled at the fact that a couple hundred Markiplier fans were already in the house and in line. The Pre-Reg volunteer cautioned us that on Friday his eager Markiplites had had to wait five hours or more to meet the Markiplier, so if he was our primary objective, we needed to get in line now now now. I thanked her for the warning, assured her we were old and had other plans, and we found a non-linear place to relax until the exhibit hall opened. 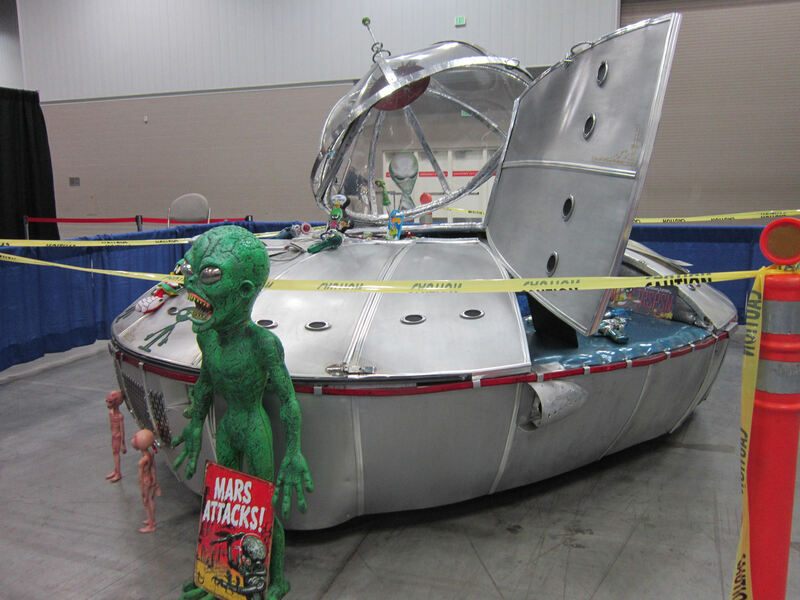 All the best conventions like to show off your favorite TV/movie vehicles, and Indy Pop Con was no exception. Technically. 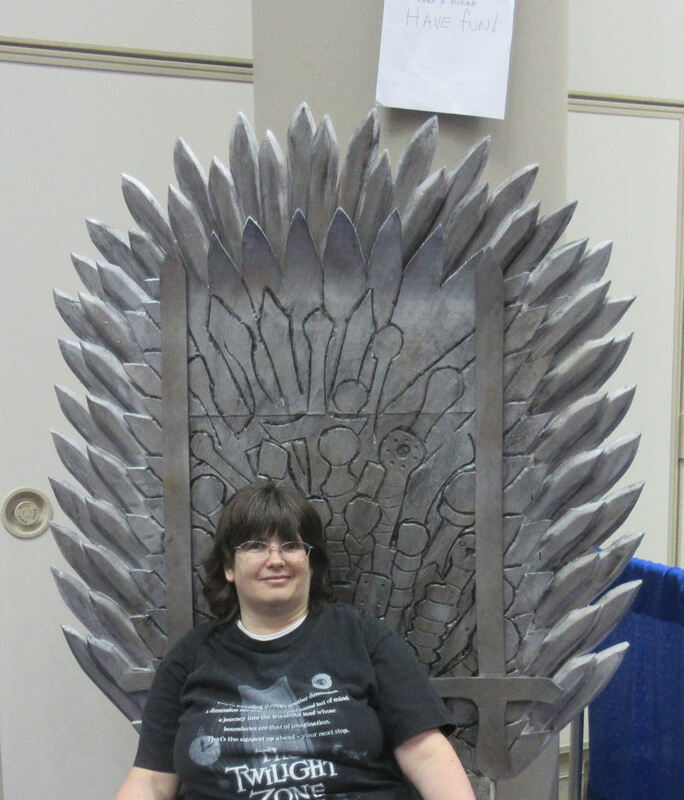 We understand this throne is from a show we don’t watch, possibly Celebrity Apprentice. 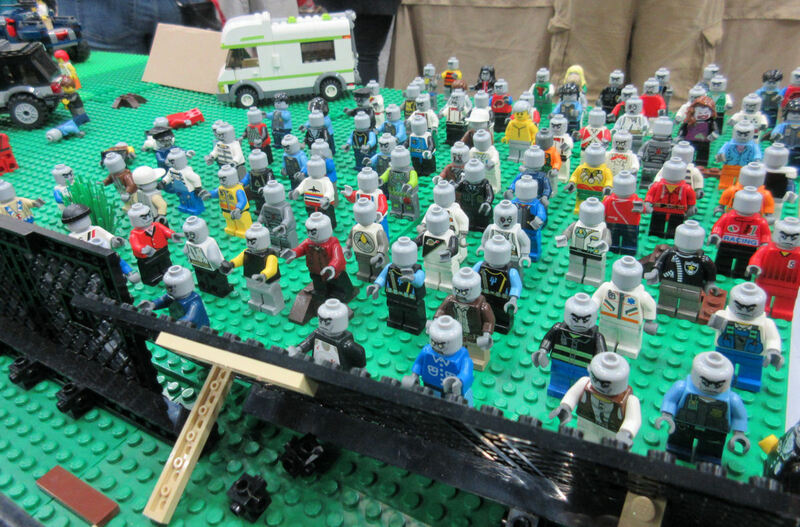 Scenes from the next episode of The Lego Walking Dead. 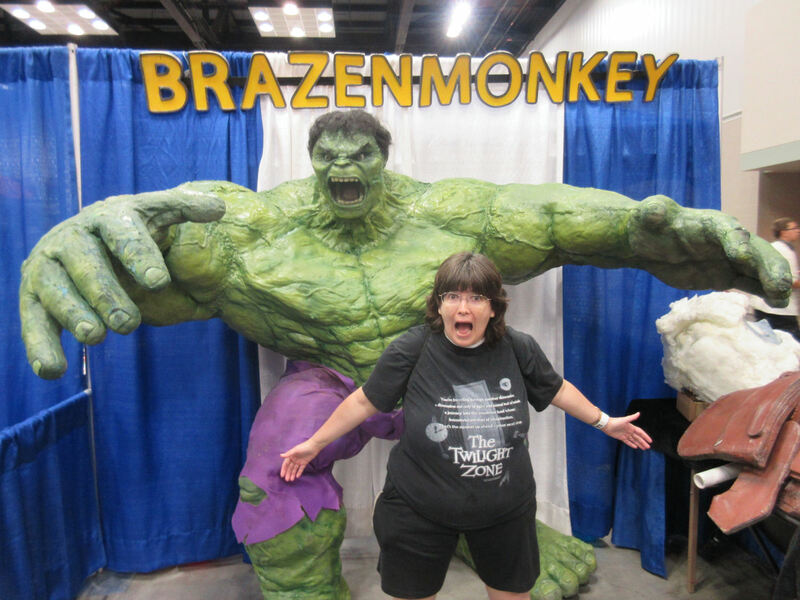 Sharp-eyed MCC readers will remember BrazenMonkey‘s Hulk statue from our Indiana Comic Con 2015 experience. This time, it was Anne’s turn to get smashed. 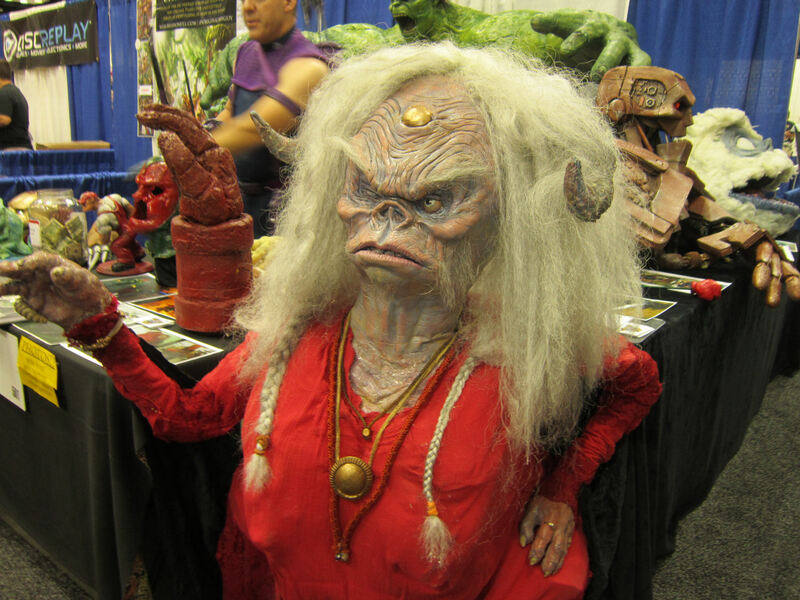 Same sculptor, new sculpture: Aughra from The Dark Crystal. Realistic spaceship staffed by authentic Space Aliens. Or, uh, something. I had the pleasure of buying stuff from Downtown Comics (my local comics shop! ), Ohio’s Gem City Books, and MuseTap Studios, who won me over with a sufficiently manly print of TV’s Ron Swanson. In the music department, Chris from Five Year Mission sold me a CD I was missing and cautioned that the band’s new album Spock’s Brain would be out this week. 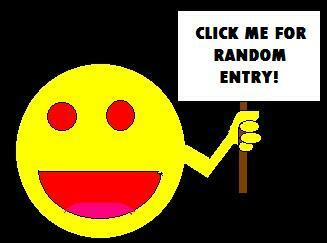 Totally worth checking out. The exhibit hall also had ’80s arcade games, anime DVDs, some kind of interactive HALO demo pod, children’s activities, reps from the highly recommended Heartland Film Festival (we have a story about that I’ve been meaning to post for years), reps from our long-running Trek con Star Base Indy, artists we’ve seen at other cons, a few friends of ours hanging around, geek fashions, TCG supplies, and more, more, more. Meanwhile in the celebrity autograph department, local hero Rupert Boneham had a longer line than many of the actors. 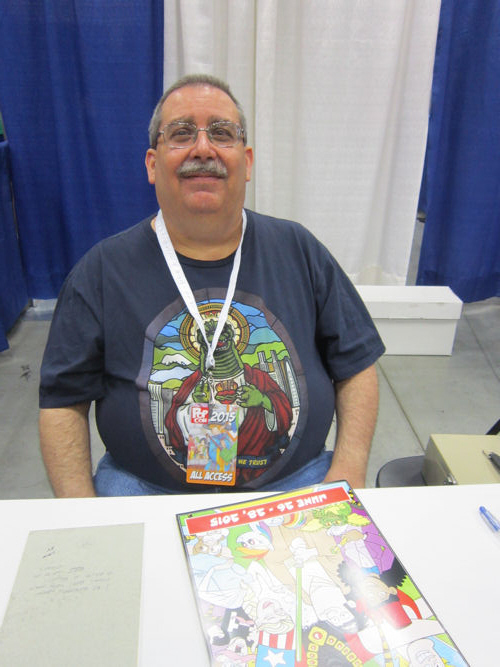 Personal trivia: one of the first two comics pros I ever met in person was Marvel/DC writer Tony Isabella, creator of DC’s Black Lightning and forty-year industry veteran who had the pleasure of working alongside Stan Lee as a young upstart back in the day. He was a guest at one of Indy’s itty-bitty comics shows back in 1993, where we chatted briefly about the frequent terribleness of the Punisher. Twenty-two years later here we were again, this time reminiscing about his years as a fun-loving columnist for Comics Buyer’s Guide, recounting CBG’s other beloved columnists and what they’re up to nowadays. When I boarded the internet back in ’99 I followed him online for a time until his then-hosts at World Famous Comics added AOL IPs to their Block list and I suddenly couldn’t click on his writings anymore. It was a true pleasure to discover he’s still online, blogs regularly, has plenty of writing projects keeping him busy, and in his spare time runs the First Church of Godzilla. There are several Facebook chapters with various URLS, but Isabella’s is the most active and therefore greatest. We heard more about the Great Scaly One when we attended an 11 a.m. panel officially labeled “Movie Blogging: Tales from the Trenches”. Though Isabella has a built-in comics-collector audience, lately he’s been getting more and more into writing about crappy old movies for fun and more fun. Joining him onstage was sci-fi podcaster Kevin Bachelder, certified B-movie aficionado and contributor to assorted movie fan sites and podcasts, who’s developed the knack and connections for scoring practically exclusive interviews with Syfy Original Movie creators. (A third panelist was scheduled but absent.) The panel title speaks for itself: two knowledgeable guys who make a living communicating to and with other fans about media and works they love or don’t love. This sounded like the kind of panel that would speak to me. Little did I expect the tables would turn. Anne and I were two in an audience that numbered nine in all. We’re no strangers to cozy group discussions (I can’t remember how many adult Bible study classes we’ve attended in which we and the teacher were the only ones in the room), but this was a new convention record for us. Regardless, I enjoyed the heck out of it. Isabella and Bachelder were both in their element, engaging on stage, and there’s a joy to be had in hearing someone talk about what they love to do for a living. After they took turns speaking about their own pursuits, they asked if any of us had sites or blogs where we liked to write about movies. Three of us raised our hands. I felt compelled to be honest, though my introvert’s sense was tingling. Then they let us each take turns talking about what we do. A guy from The Film Yap went first and described an organized, professional-sounding site whose amenities include a volunteer staff and access to DVD screeners. Then came my turn. I knew this would be beyond weird, but I refused to give in to fear. And so…well, the next three minutes of my life remain a blur. Understand: it’s not that I mind talking to strangers or groups, though I’ll confess I have rare opportunities to practice nowadays. But I very, very, very rarely discuss MCC out loud with other humans. Any friends or family not already aware of it remain in the dark about its existence. I loathe unsolicited self-promotion, I seethe whenever I think of the few times I’ve mentioned it to ostensible loved ones and gotten polite glassy stares in return, and I can think of exactly twice in the last three years when I was approached by folks who’d recognized my byline and went out of their way to compliment what they’d discovered by search-engine chance. I had no sales pitch prepared, no bullet points in my pocket to impress talent scouts, no “commandeer a panel” item on my Indy Pop Con to-do list, and no reason ever to expect an in-person audience beyond my own wife. So I spent far too many minutes saying…things? Maybe? Hopefully some of them were shaped like sentences. I know I was trembling a little by the time my mouth finally shut down, but it wasn’t accompanied by that debilitating blood-draining sensation I used to get in high school debate class. Just the same, I was dazed enough by the discomfort that I regret I completely missed the third guy’s intro. Otherwise I’d be glad to link to his site in a gesture of 11 a.m. movie-blogging panel solidarity. I faintly recall his site also had one of those “staff” things that I guess are all the rage. The rest of the panel was Isabella and Bachelder giving advice from their perspective, much of which rang true to me from a combination of my own MCC experiences and from years of running across blogs-about-blogging (cf. WordPress.com’s own Daily Post). All of it was sound and appreciated, and my brain levels were back to normal when the panel’s time slot ended. 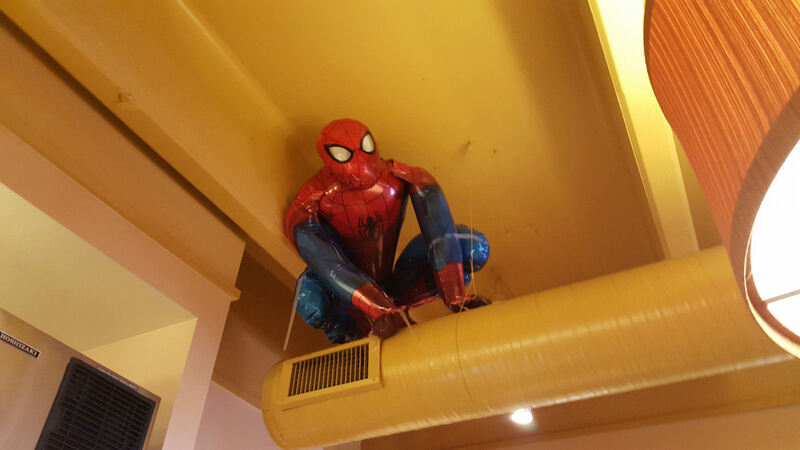 For an intermission, Anne and I walked down the street for lunch at Noodles & Company, which was decorated for the weekend with photos of the various Indy Pop Con guests and other flourishes here and there, including an inflatable Spider-Man monitoring the drink machine from above. 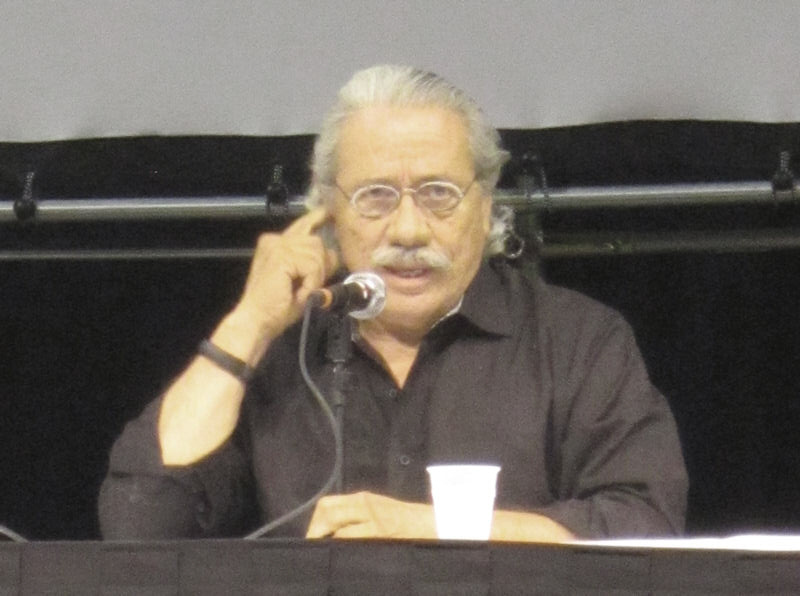 Upon our return was the main event: the Edward James Olmos Q&A. 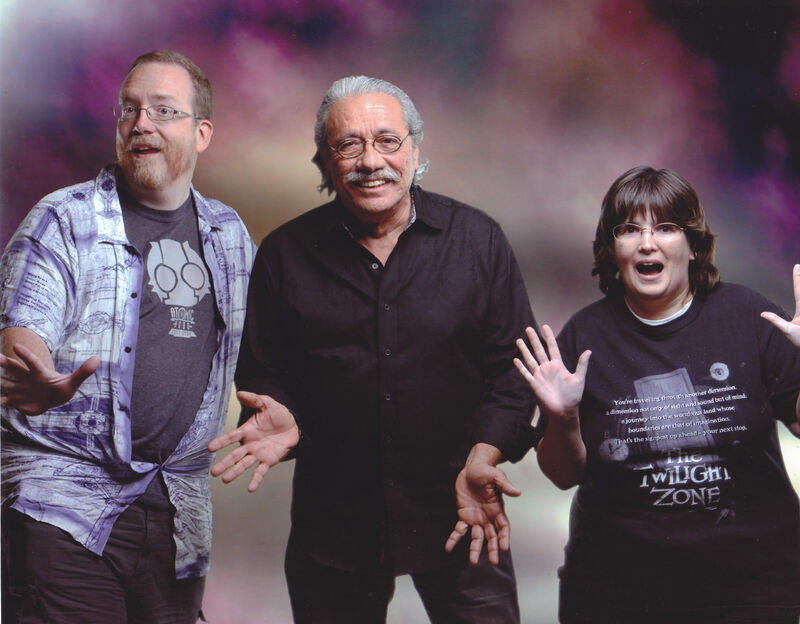 Also a highlight: our subsequent Edward James Olmos photo op. The line was criminally short and over in seconds. Photos took less than ten minutes to print. While we waited, an Indy Pop Con rep took to the Main Stage to explain the new ticketing procedure they were just now devising on the fly as a desperate way to sort out all Markiplier’s remaining unmet fans so that at least several hundred of them could have their one big Indy Pop Con wish come true before the end. It sounded needlessly complicated, and involved either several hours of sitting at that same Main Stage without moving, or coming back Sunday before sunrise. Or something like those options. We picked up our photo. We wandered the show floor one last time. By 3:05 p.m. my to-do list was essentially done. We snapped a few more pics on our way out and considered ourselves lucky we weren’t Markiplier fans. As we neared the exits, I was approached for one last conversation by a fellow Atomic Robo fan who recognized my shirt as a reward from the Atomic Robo: Last Stop Kickstarter campaign, about which I’ve written on my displeasure more than once on MCC. He and I were both backers, though his pledge was at a higher tier. I received the last of my rewards in the mail on January 20, 2015, a full thirty-five months after the original planned delivery date. As of June 27, 2015, he’s still waiting for his. He wasn’t mad at me or anything, but now that he knows for sure those overdue rewards exist and have been selectively shipped, I can’t imagine it made him feel any better. At all. I know his frustration. That was my frustration for literally years, and it’s unfair that I’m all set while they’ve left him and other Atomic Robo fans hanging. It’s a terrible feeling when you think you’ve found a way to connect with a pop-culture icon that’s meant so much to you, only to have promises unkept, expectations fallen apart, and your fandom diminished and even soured by lousy circumstances. It’s one of those dark undersides of the sunny pop-culture experience — when we can’t get what we want, what we paid for, what we thought would be the greatest thing of all times. That’s the kind of misfortune that ruins a mood, a day, or a belief in a hero. Late Sunday night, I checked Indy Pop Con’s Facebook page out of curiosity and found it besieged by a good number of unrequited Markiplier fans bearing virtual torches and pitchforks, some of whom had driven ten hours or more across multiple states — one from as far away as California — only to be denied the Markiplier experience. For some even their VIP badges were useless when the volunteer staff found themselves outnumbered a zillion to one by the teeming general-admission horde. Markiplites found themselves divided into camps of mets and met-nots, and the results of that schism were not awesome. I read from one trapped soul that the Main Stage overcrowding had also complicated the seating arrangements for the Saturday night costume contest. If I hadn’t lost the urge for cosplay-photo hyperdrive like we had last year, odds are I would’ve stuck around and counted myself among the fuming and the furious. As it was, apparently we saved ourselves a lot of anguish. For the six-hour experience we made for ourselves based the viable options presented to us, my wife and I remain grateful to Indy Pop Con for giving this aging couple a chance to have another enjoyable time. We’re glad we ultimately decided to come, but our hearts go out to those who can’t say the same. 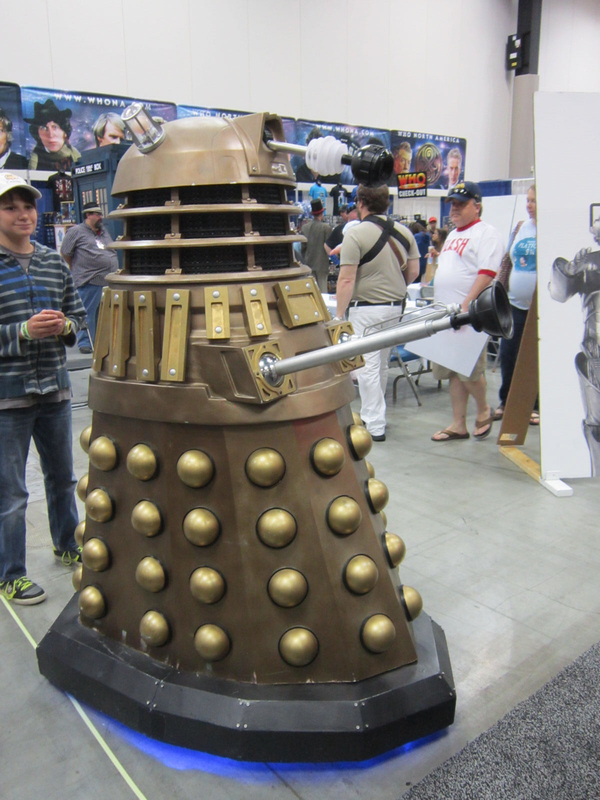 « Indy Pop Con 2015 Photos, Part 2 of 3: More Costumes!